With Image Captor Portable you can capture images from any source available in your Windows computer. You can get images from files, scanners, digital cameras, webcams, tv-tuners, whatever displayed in your screen, etc. After you capture the images, you can crop them to get only what you want. All can be done easily and intuitively. Almost zero learning curve.It is planned that in version 1 Image Captor would have the ability to upload captured images to facebook social network. So stay tuned.You can save captured images in the following formats. Given this is a portable tool, no installation is required to use it, hence no changes are made to your PC. There are various devices you can connect to a computer in an attempt to grab images, such as webcams, TWAIN devices, and more. However, you might not be interested in the entire picture, case in which specialized applications like Image Captor Portable want to offer the means of letting you both capture, and define the region of interest. As the name clearly points out, this is the edition of Image Captor that doesn’t take you through a setup process to make sure everything work, so you can just as well carry it on a thumb drive in case your work involves using other computers besides your own. Registry entries are not modified in the process, so the health status remains intact. It’s a good idea to first make sure the source device is connected and running well before running the application. This can be a webcam, TWAIN device, while other methods include options to capture screen activity, or paste picture from the clipboard. There’s also the possibility to load an existing image from your computer. File support isn’t really abundant, but you do get to work with some popular types, such as JPG, BMP, and PNG for both import and export capabilities. When saving as JPG, you’re also offered a slider with which to adjust output quality. Another core function of the application is to help you select a region of interest, namely to crop. This operation is easy enough, as it only requires you to adjust the size and position of a box which highlights regions on your picture. You’re then free to save the whole image, or just the selected section. 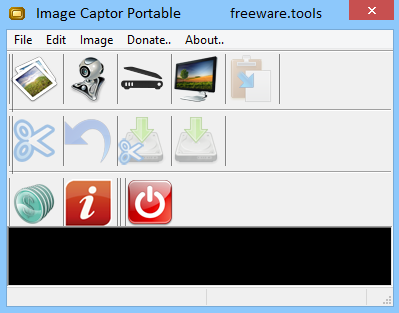 Image Captor Portable is a lightweight application which can be used to easily capture pictures from different sources, define a region of interest, and save the new image under one of several file formats.